Whether it be in terms of creators or fans, horror is not – nor has it ever been – the ‘boys club’ it is so commonly assumed to be. 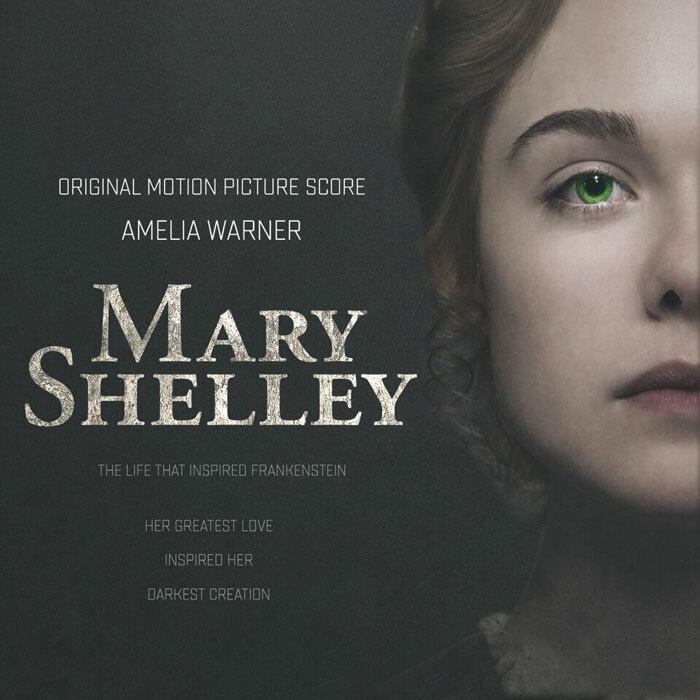 In Haifaa al-Mansour’s recently released biopic Mary Shelley, the author is told by her stepsister Claire Clairmont upon first reading her famous novel Frankenstein: ‘I’ve never read such a perfect encapsulation of what it feels to be abandoned.’ At its best, horror is all about outsiders, its focus emphatically upon the experience of otherness. The power of Shelley’s novel is how she gives that sense of isolation a voice, demanding we reconsider who we conceive of as ‘monstrous’: is it the terrifying yet desperately lonely creature created by the mad, egotistic Dr Frankenstein, or is it the doctor himself who rejects his creation, repulsed by the very physicality he himself was driven to construct? The influence of Mary’s body horror story has been one of the major influences on contemporary horror, in terms of its narrative, iconography and broader themes, equalled perhaps only by Bram Stoker’s Dracula. Try telling Shelley that horror isn’t ladylike. The film begins with Mary – played by Elle Fanning – indulging in a ghost story, hidden from her parents, relishing every word and tingle. She shares this passion with Claire (played by Bel Powley), who tries to hide Mary’s whereabouts from their disapproving father and Mary’s step-mother, William Godwin (Stephen Dillane) and Mary Jane (Joanne Froggatt). Godwin himself was a figure of some repute as a political philosopher and novelist. But it was his late wife – Mary’s mother – who was even more renowned, the pioneering eighteenth-century feminist Mary Wollstonecraft. Although she died just days after giving birth to Mary, her influence on the young woman’s sense of self and the long-term trauma of her loss are privileged in al-Mansour’s film. After Wollstonecraft’s death, Godwin wrote a biography that revealed his late wife’s less-than-traditional approach to sexual relationships, triggering a scandal that would haunt Mary into adulthood when she would live and have a child with a married man (the romantic poet Percy Bysshe Shelley). In the film, Mary recalls one of her mother’s lovers, the painter Henry Fuseli, as she and Lord Byron (Tom Sturridge) look upon his 1781 work The Nightmare in Byron’s house in Geneva, where she visits with Percy and Claire. 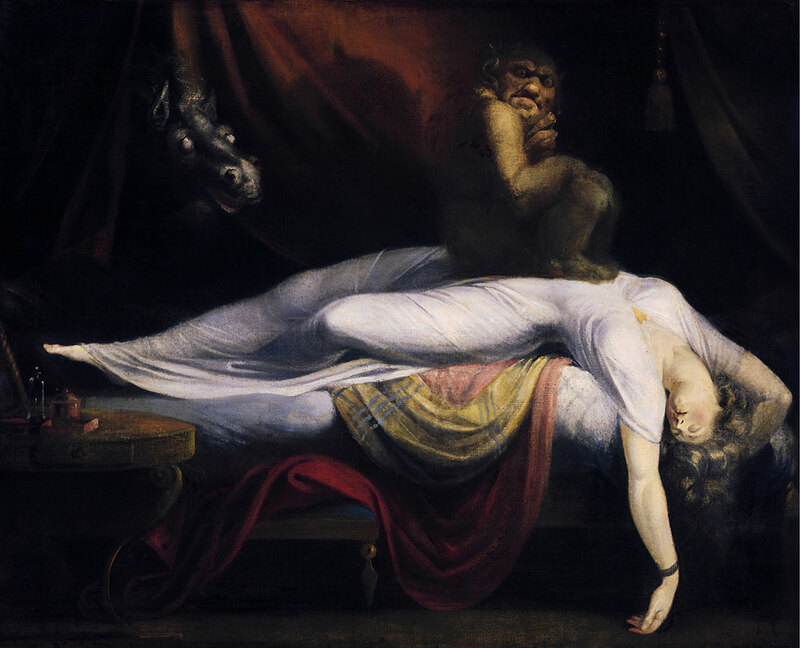 It is a large oil painting featuring a woman in white lying on her back, in a deep sleep, her head drooping off the side, her arms dangling down. Atop her sits a small monkey-like incubus who stares directly at the viewer, while a black horse hides in the background, watching. 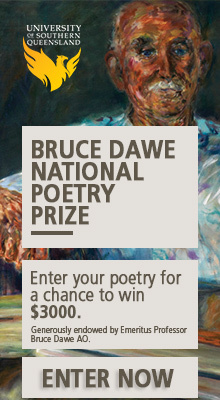 It’s a striking and disturbing painting, and its imagery would have a direct influence on Frankenstein. This coming together of Mary, Percy, and Byron is, of course, the stuff of legend, and al-Mansour’s film is not the first to reimagine it on screen. James Whale’s Bride of Frankenstein (1935) famously opens with Elsa Lanchester in the role of Mary talking to Byron (Gavin Gordon) and Shelley (Douglas Walton), and Ken Russell used their get-together as the premise for his gloriously demented Gothic (1986). Along with John William Polidori, the story goes that it was on a stormy night in Geneva that Lord Byron invited his guests to write a scary story: Polidori wrote The Vampyre (published initially in 1819 erroneously as a work by Byron), and Mary, of course, wrote Frankenstein. Mary Shelley perhaps unsurprisingly uses the writing and eventual publication of Frankenstein as climax of the film, not merely focusing on the journey of the famous book making its way into the world but – more importantly – signifying Mary’s autonomy as she rose above the difficulties she faced in her life, due to her non-orthodox relationship with Percy and the death of their child. The film is marked by a contemporary feminist stance in its focus on Mary’s determination to find a voice and rise above the various scumbag men that surround her. The film is in many ways usual ye olde biopic fare: the seemingly typical festival of overlaboured diction and wobbly fake accents, with braided hair and flowing frocks aplenty. While ostensibly a romantic drama based on the relationship between Mary and Percy, the latter is little more than a two-dimensional manchild, Lord Byron faring even worse in his representation as a kind of proto-goth sleaze. As Mary herself, Fanning certainly does not lack earnestness, but an air of pomposity to her performance in scenes with particularly heightened emotion carries that unmissable scent of the Oscar hopeful. None of this, however, reduces what makes the story of Mary’s life as told in this film so intrinsically fascinating. I’m currently writing a book called 1000 Women in Horror that focuses on the many women – some well-known, but most unheard of or forgotten – who have played a significant part in the film genre’s history, either in front or behind the camera. The question of women’s authorship and horror is today often considered a fairly new one, with listicles of the same names tiresomely regurgitated every time a woman-directed horror movie makes a splash, as seen in recent years with the success of The Babadook (Jennifer Kent, 2014), Raw (Julia Ducournau, 2016), and A Girl Walks Home Alone at Night (Ana Lily Amirpour, 2014). The usual suspects often trail somewhere behind: Mary Harron’s American Psycho (2000), Mary Lambert’s Pet Sematary (1989), Kathryn Bigelow’s Near Dark (1987), and – if you’re lucky – the films of Karyn Kusama and the Soska sisters thrown in for good measure. I would hope that the lack of originality in these sorts of lists demonstrates less a tendency for plagiarism than what I suspect is an even more troubling, unspoken assumption: that horror films directed by women are by definition a fundamental novelty. Be they ‘ten horror films directed by women!’, ‘twenty horror films directed by women!’, or ‘fifty horror films directed by women!’, there is implicit here a silent ‘can you believe it?!’. Yes, I can. And so could Mary Shelley. If we step back and look beyond the last five to ten years and beyond English-language speaking countries, it becomes readily apparent that the main problem with a book called 1000 Women in Horror is that it is impossible to include every single woman who directed a feature-length horror film (and keep in mind I’m not only focusing on filmmakers, but actors, editors, sound specialists, cinematographers, etcetera). Even a cursory glance at films – from Czech New Wave director Věra Chytilová’s Vlčí bouda (1986) to Hong Kong New Wave filmmaker Ann Hui’s Visible Secret (2001), American grindhouse director and pornographer Roberta Findlay’s The Oracle (1985) to acclaimed Australian visual artist and photographer Tracey Moffatt’s BeDevil (1993) – makes it readily apparent that not only have different women made different kinds of horror movies, but they have done so across an impressive range of cultural and historical contexts with a variety of budgets and local industry constraints. At its weakest, al-Mansour’s Mary Shelley is a colour-by-numbers biopic. But at its strongest, it pays close attention to precisely how Mary channels her trauma and pain and suffering into her art – horror storytelling – thus historicising a creative propulsion many, many women have had for literally centuries. In literature, some of the most celebrated horror writers have been women: even a preliminary list should include Shirley Jackson, Daphne du Maurier, Silvina Ocampo, and Anne Rice, and of course predating Mary the gothic period was marked by the presence of key writers such as Clara Reeve and Ann Radcliffe. Mary’s story as presented in this film is a vital one to recall at this moment in time when there is a such a strong focus on diversity and the historical biases that have determined who gets to tell stories, be it in film or literature. Despite men being the most visible and most industrially supported voices, and although men and the film industry might like you to think otherwise, women have long found ways to tell their own scary stories. In Frankenstein, Mary did more than give voice to a monster: she let an outsider speak and tell their own story their own way. Like the best body horror, Frankenstein demands we rethink the politics of what we assume to be transgressive, deviant bodies through an explicit demand for courage, love and understanding. Mary Shelley granted horror its humanity, and to forget the centrality of women’s work in the wider story of horror is not just an insult, but a rejection of that very humanity.